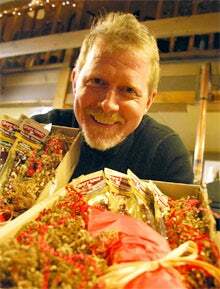 They say the fastest way to a man’s heart is through his stomach, so you probably can’t go too wrong with this beef-jerky bouquet from Gary West Smoked Meats. The bouquet of one dozen long-stem steak strips sells for $39 with no shipping fees. Owner Paul Murdoch says Christmas still reigns supreme at Gary West Smoked Meats, but Valentine’s Day is a close second. Many people might not consider a gift of beef jerky very romantic. But the quirkiness is part of the appeal. Fox News, Cosmopolitan and other media snapped up the story, and orders surged, Murdoch says. The company’s targeted use of Facebook advertising has been especially effective. After the Cosmo piece, Murdoch realized that his core customer is women in relationships with men. “We’ll use Facebook primarily because you can target that demographic so accurately,” he says.